A spacious, airy and modern facility was the brief when GF Tomlinson and Maber Architects were contracted to build a new sixth form centre at Nottingham High School for Boys. 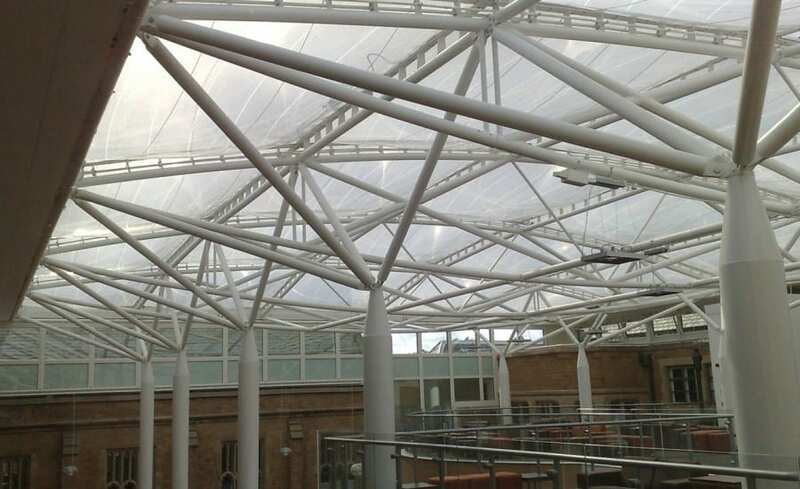 Faced with this challenge, the architects developed a design which included a complex ETFE cushion roof and approached Architen Landrell to assist with the design, manufacture and installation. The project entailed providing a multiple steel truss arrangement supported on a series of steel columns to support the 25 no. 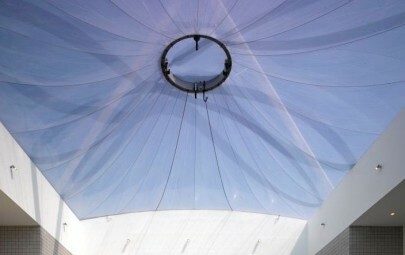 two ply ETFE foil cushions. The roof covers a courtyard made up of the existing surrounding walls of the old school; now protected from the elements, the space can be used as a new dining and recreational area. Maber Architects were keen to combine old and new; the original school buildings are nearly 500 years old and incorporate intricate stonework designs. Therefore, by installing an ETFE cushion roof along with two levels of mezzanine floors and an acoustic sound pod as the centerpiece of the structure, the aim was to create a beautiful juxtaposition between these building materials. The weight of the material was not a small factor in the material choice. 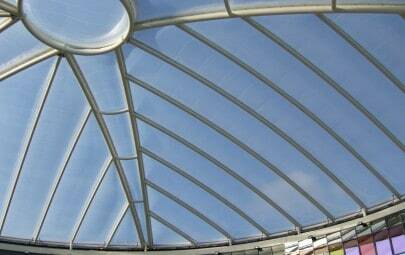 Weighing in at approximately 1% of the weight of glass the ETFE cushion system requires significantly less heavy duty steelwork than a traditional glazed system. 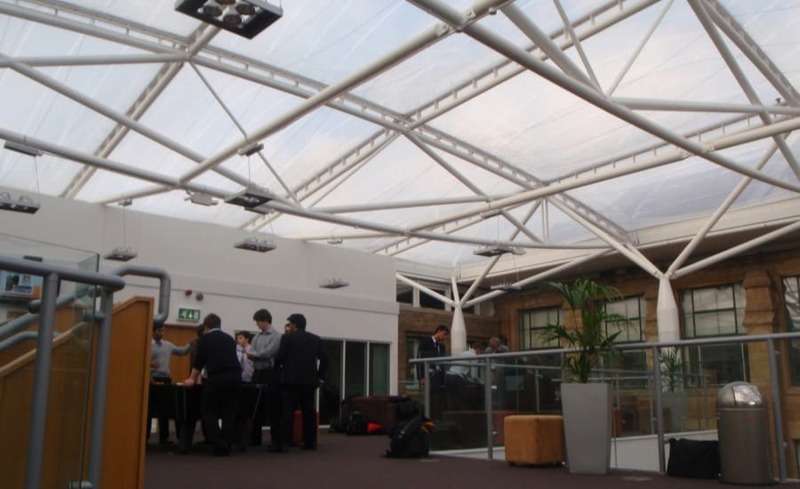 As a result, the steel truss design used at Nottingham Boys School has a lightweight appearance, adding to the airy feel to the courtyard area and complimenting the bulbous appearance of the ETFE foil cushions. 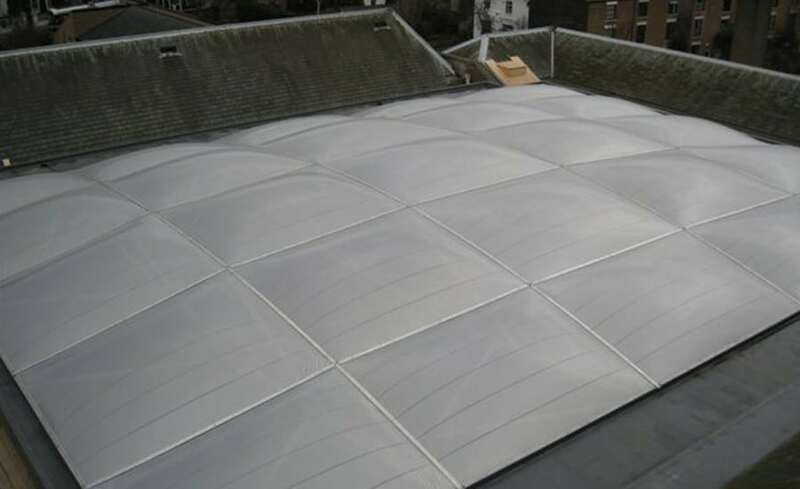 As well as the visual impact of the cushion roof the ETFE structure provides a feel of a light and open area, which is both watertight and achieves the thermal requirements; the two layer cushion system achieves a U value specified by the architect at the outset of the design process. In addition, solar glare was reduced by applying a fritted honeycomb pattern to 70% of the surface area of the external layer of the ETFE cushions this achieves around a 40% reduction in solar glare. 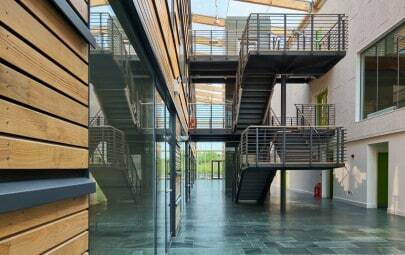 The two mezzanine floors in the space provided an extra design challenge for Architen Landrell and the design team. 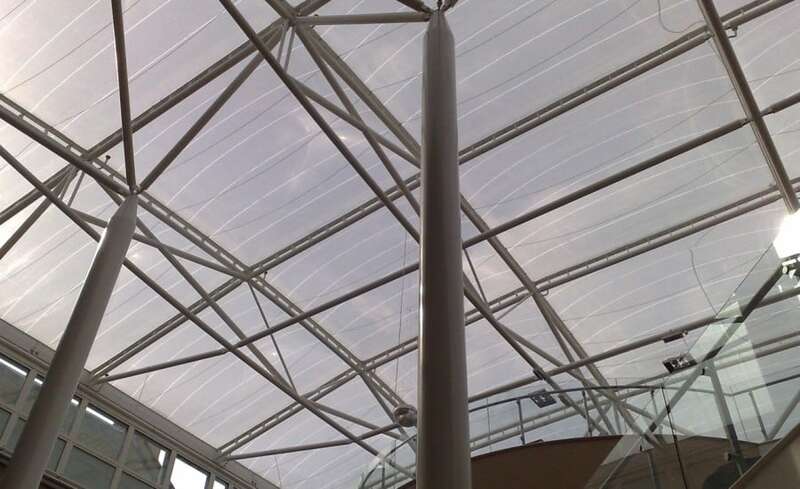 ETFE cushions can be noisy on a rainy day and when people are positioned so closely to the roof as in this case, the acoustics of the system need to be considered. In order to mitigate the problem at Nottingham High School, Architen Landrell fitted a sound suppression system to reduce noise levels during heavy rainfall; this layer acts as a dampener to soften the sound of the droplets hitting the tensioned cushion surface. Due to the atrium being an enclosed courtyard, access to the internal space was only possible through a small entrance within one of the existing walls. This made installation of the supporting structure extremely challenging. The assembly of the supporting steelwork had to be carefully coordinated with other contractors, using cranes to lift it over the building and lower it into position within the courtyard. Once the steelwork was installed, our specially qualified installation team rigged working nets to provide a platform on which they could install the ETFE cushions themselves. This was used in conjunction with rope access techniques. On completion, the brand new Sixth Form Centre and Dining Hall was officially opened by the Lord Lieutenant of Nottinghamshire, Sir Andrew Buchanan and School Captain, James Taylor and has since received much acclaim. With the new centre being a usable space at the heart of the school, sixth form students are able to play a key role in school life and also provide an inspiration to younger pupils – a key requirement when the design for the new centre was originally conceived. Architen Landrell Project Manager Mark Jenkins comments, This prestigious project brought its own challenges however, the resulting structure is both eye catching and functional, well done to everyone involved.